Fancy truffles in a fancy tin. I’ve never really had truffles before. I’ve had things with truffle in them – subtly worked into the background of the dish as an transient grace note – but nothing that really plays up to the full truffle flavor. 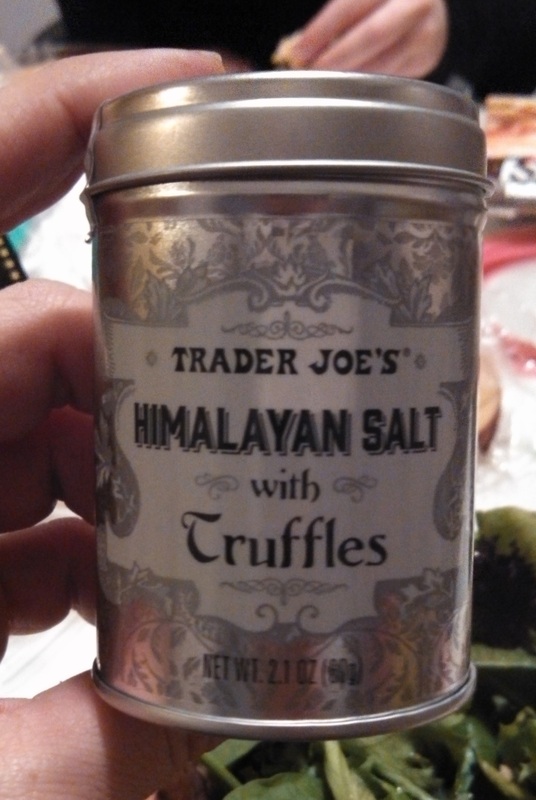 Thanks to Trader Joe’s Himalayan Salt with Truffles I can no longer say that. I have been thoroughly overwhelmed by intense truffle flavor. Before I start jibber-jabbing about the salt itself, the let’s define terms and make sure we know what we’re actually taking about when we say “Himalayan Salt with Truffles”. As we all know, truffles are that subterranean fungus rooted out by hogs and dogs in Europe. A firm fixture of haute cuisine, these lumpy tubers go for up to twenty two hundred dollars per pound for the finer species – the so called, “diamonds of the kitchen” and so on. That’s all proper and good and fancy. Himalayan salt, often billed as “pink Himalyan salt”, is a fancy marketing term that stores like to sling around instead of the more technically accurate phrase “rock salt from Pakistan”. The second largest salt mine in the world just happens to be located in Punjab, Pakistan, a mere 186 miles from the Himalayas, and is the source of practically all the “Himalayan” salt you see in America. This sort of labeling that makes one think that marketers have much more of a loosey-goosey approach to geography than the rest of us, the sort of approach that might lead to vague geographical generalizations with things like balsamic vinegar as well. The salt from these mines is often imbued with impurities of iron oxide (aka, “rust) which results in a pinkish, or at least off-white, color. If, like me, you’ve never really had truffles before, you’re probably wondering what truffles taste like. What does this underground fungus offer that we feel the urge to shave it into our luxury condiments? Like most percepts in this world, for example the color blue, or the feeling of tilting just slightly too far back in a chair, absolutely novel tastes and smells are difficult to describe without referring to the experience itself. Blue, you might say, is a bit like green without so much yellow in it, and tilting just slightly too far back in a chair is said to feel like your stomach does a little flip and drops into a void. The point is, in the same way it’s hard to describe a persimmon, it’s hard to describe the odor of truffles. Nevertheless, I’ll try. The odor of truffles is a bit like sticking your nose in a sweaty tennis shoe and taking a whiff, but in a good way – in an elegant way even. Truffles don’t stink – not in the least, but they are intensely musky and pungent. In the same way the musk of a good, hot tennis shoe is going to linger in your nose for a few minutes, so too does the truffle odor here. What’s true of the smell is even truer of the taste. Though this truffle salt is about 99% salt to 1% truffle, it’s the taste of truffle that’s going to hit you first, and last longest. After dusting my eggs with a pinch of this stuff I was tasting that elegant truffle musk on my tongue for 15 minutes after I finished the plate. The take away here is that truffle are not to be screwed around with. Normally I would have written “truffles are not to be triffled with”, but the flavor of these things is so damn intense that cute wordplay simply has no place. If you’ve tried truffles before, you know what you’re getting into with this stuff. If you haven’t I’d recommend you give it a shot – it’s a flavor unlike anything you’ve experienced in your grocery store before, and hate it or love it it’s going to expand your horizons at least a little bit. I do have one big gripe with Trader Joe’s truffle salt. Despite the outlandishness of the product origins, the craziest thing about this salt is that the decided to package it in a little tin with no shaker built in. You simply take off the top and have to do your best to shake a tiny bit out the widemouthed opening. Trying to do this with regular salt is crazy enough, but when we’re talking about a seasoning that’s been supercharged with the culinary equivalent of nitro glycerin it’s downright absurd. It’s unfortunate that the packaging is so pretty, because if you buy this you’re either going to want to dump it a different salt shaker that actually has holes or take your chances dancing with the devil every time you want to season your potatoes. Trader Joe’s has brought in their salt as part of their holiday gift roll out – sticking it on the shelves alongside their exotic chocolate and tea collections. On one level I understand this, truffles are fancy and it makes you feel good to give things that people think are fancy. On another level however this makes a terrible gift – or at least a very specific and niche gift. The truffles taste so strongly that it’s bound to polarize people into love it/hate it camps. If you don’t know that the person you’re giving your gift to is into truffles, you’re risking getting them something they’ll just chuck into the trash. Chocolate’s going to be much safer. On the other hand, if you know they are into truffles then odds are they already have a reasonably priced truffle salt on hand or simply don’t want one. Really, the only person this gift is going to work for is the friend who you know is into trying crazy new foods but hasn’t gotten around to truffles yet. In other words, me – and I just bought some. Would I Buy It Again: I like it, but this one tin will last me about 10 years. Would I Recommend It: Yes, try a crazy salt, live a little! Final Synopsis: This salt that packs a ton of pungent truffle flavor.